Born in Hartford, Vermont, Abraham left there in 1820 to head west through Cleveland on the first steamer on the Great Lakes, the “Walk-in-the-Water”. By 1823 he had reached the Ohio River, and engaged in the river trade to New Orleans. After marrying Frances Johnson in 1827, he set up a store, first in Evansville (1828) and then in Newburgh (1830). Beside trading to the south along the rivers, he made yearly trips to New York for manufactured goods. He operated the Newburgh Pork House and, through his brother-in-law, Jacob Sargeant, he was involved in the coal business. He was also an extensive landowner. Realizing that land as well as river transport was necessary for Newburgh’s growth, Phelps instigated and was an officer and major stockholder in the Central Plank Road Company, which operated a one-lane toll road to Boonville. Many clerks that worked for Phelps in his various businesses would go on to be prominent citizens in the town and throughout the country. Successful financially, Phelps was also a notable philanthropist. In 1837 he built the first church in Newburgh, which became the Newburgh Presbyterian Church (now a museum). In 1843 he helped found an academy in Newburgh, and he later donated $20,000 in an effort to get a college to locate there. In 1860 he donated land for the German Zion United Church of Christ. The marriage of Cadwell Phelps and Margaret Hamilton was consummated February 19th, 1775. Of this union four children were born, including Abraham Phelps, who was born January 6th, 1798, in Hartford, Windsor County, Vermont. His father was of English extraction and had settled some two years before. At that time the country was almost a wilderness, and the newness of the territory, in connection with the father’s limited means, made the education of his children rather a slender affair. To make amends for it A. M. Phelps, when released by his father at the age of nineteen, worked two years at ten dollars per month, then entered the Royalton Academy in Vermont and was a student there for about a year. On the 10th of June in 1820, with his wardrobe packed and slung over his back, and only thirty-three dollars in his pocket, Abraham bade adieu to his New England home, and set his face westward so intensified with the idea of his land of promise that four hundred miles of foot travel was to him no dissuasion. Cleveland, Ohio, was his main objective, and between it and his old home were many long and weary miles. His start was on Monday, and on the following Sunday he came to a church on the Mohawk River in New York, where a congregation was worshiping inside, and a large number of boys playing ball outside. To him this looked oddly enough, coming, as he did, from the land of steady habits. In a few days he reached the Genesee Country, New York, and saw in process of construction what was in that day sarcastically termed “Governor Clinton’s Ditch,” which is now known today as the Great Western Ship and Barge Canal. Shortly after this he reached Lake Erie at a point four miles below Buffalo (called Black Rock), where the steamer Walk-in-the-water, the first and only vessel of its kind then running on western waters, was to make its departure on the next day. Steam navigation at that time was crude and imperfect. Therefore, on the appointed morning those concerned thought that to make the vessel walk in the water, a tow line from the steamer with four yoke of oxen hitched to it would help. With Niagara Falls not so far off, whose current might give the boat a backward motion, all caution was taken. Ultimately the boat advanced about two miles an hour. When the danger of the current was passed and the oxen unhitched the boat had a speed of from four to five miles an hour, which enabled Mr. Phelps to reach Cleveland (200 miles away) in fifty-six hours. But steam power, as applied to navigation, was then in its infancy, and the novelty of calling oxen to the aid of steamers soon become obsolete. An uncle and aunt who lived in Newburgh (a suburb six miles from Cleveland), persuaded him to visit for two weeks. The town has since been absorbed by Cleveland and is no longer on a map. He then worked as a hand on a flat boat bound for New Orleans, but before starting invested all his money in flour and chickens. His funds enabled him to ship forty barrels of flour and thirty dozen chickens. This was in April 1823. The Miami was the river of mill-dams, and the boat had to run over twenty-four of these before it reached the Ohio River. Consequently, the river first needed to rise. The voyage down the Ohio was a very pleasant one for Phelps, and his opportunities for examining the towns and country along the banks were quite good. Of the many places that he saw on this trip, Evansville attracted his attention most, and he selected it as the place of his permanent residence. While in Louisiana and Mississippi he had learned that the reeds used in weaving were scarce and commanded a very high price. This inspired his ingenuity, and on his return to Evansville, which was in June, he went into the manufacture of weaver’s reeds, the canebrakes of Kentucky being his chief field of supply. He so assiduously worked at this that by the middle of November he had about one hundred ready for sale. The reeds required the construction of a large skiff with a canvass covering to give shelter from the weather. When completed, he, with a boy named Jones, whose mother’s name was Abbot, made his second trip to the South. His reeds were sold for two to five dollars each, the pay being partly made in beef hides, deer skins, and beeswax, which he sold in New Orleans. While making this second trip he became acquainted with a Philadelphia merchant at Vicksburg, who bargained with him to sell goods for one year. He chose Florence, Alabama, as the place where the merchant would supply Mr. Phelps with the goods. To carry out this project his second return to Evansville was followed by a trip to Florence, where he prepared himself for this job that lasted about a year. Next he chose to sell equipage and kept the horse on which he traveled to Memphis. There he disposed of the horse, and took steamboat passage for Natchez. In this city he came in contact with a Mr. Wade, from Boston, with whom he contracted for a supply of goods. Phelps agreed to sell them in a floating trip down the river, a skiff being used for the conveyance. When he wanted to return he used a steamer to take the skiff to Memphis, when a new supply was laid in and a new trip commenced. Five trips were thus made in one season. Through this he earned a profit of about one thousand dollars. He invested this in a stock of dry goods, boots, and shoes, and returned to Evansville in June of 1827. On July 17th of 1827 he married Miss Frances Johnson, with whom he had met about a year before. The following October he put all of his goods in a small flatboat, employed by an Asian named Dave, who formerly worked (perhaps as a slave) for Hugh McGary, one of the founders of Evansville. Again Phelps started down the river on a peddling expedition and reached New Orleans in January of 1828, where he purchased a fresh stock of goods. This was his permanent start in business after which he returned to Evansville and started mercantile trade in a frame house which then stood on the site of what would later be Marble Hall (now Old National Bank tower). 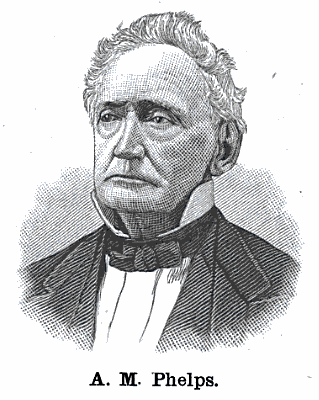 His first clerk was James G. Jones, later a Judge, who was then about fourteen years old. Jones lived with Phelps for two years until he sold out his stock of goods. While in business he took in pork and nearly all kinds of produce, which he shipped to New Orleans in flat boats, making two or three trips a year. In 1830, after selling out his stock of goods, and finding himself with about two thousand dollars, he decided to visit his old home in Vermont, from which he had been absent ten years. On his return he stopped at New York and invested all of his money and credit in a fresh stock of goods. He took all of this to Newburgh, Indiana, which he had decided to make his future place of residence. This occurred about the 1st of October, 1830. Thereafter he has travelled in the stage coach and canal boat more than forty times to ship goods, most often to New York and Philadelphia. In those days the locomotive had not crossed the Alleghenies, so he found himself on the Atlantic seaboard to sell even more goods. For many years after Phelps returned to Newburgh he faced little business competition. Though the town was at that time only a hamlet and the country very thinly settled, customers from Pike, Dubois, and Spencer counties made Newburgh their commercial center, and built up for Mr. Phelps a large produce business. In addition to this, of the settlers who were then living on government land, many purchased their own land on money loaned from Phelps, giving him a reasonable interest. He would also occasionally ship produce to New Orleans for area residents. This bartering business required several flatboats every year to take off the produce that came into his hands. The county records show that about one tenth of the lands in Warrick County have passed through his hands. Over the years he employed many clerks, including his brother Cadwell Phelps, who, after two years of service started a successful business in Boonville. There was also Neely Johnson, afterward Governor of California, Henry Williams, Albert Hazen, Union Bethell, Smith Hazen, Isaac Adams, John DeArmon, Tillman Bethell, D. B. Hazen and Robert Hall, most of whom became prominent Newburgh citizens in their own right. In 1855, and indeed for some years before, the coal fields of Southern Indiana were in development. About this time the first coal shaft in the Newburgh area was sunk on Mr. Phelps’ land. Later he conveyed this land to his children and reserved the coal rights, though he later also gave it to his heirs. The royalty on the coal taken from these lands amounted to over two thousand dollars per year, a large sum in those days. Phelps’ religious career dates from 1834, and in 1837 he built the first church in the county. This house was located in Newburgh, and, after its completion and preparation for service, was donated to the Cumberland Presbyterian Church, of which body Mr. Phelps was a member. It was afterwards donated to Indiana Presbytery for school purposes. Mr. Phelps may be regarded as Newburgh’s pioneer merchant, and he left Evansville with the view to supply a need, in making it more convenient for the farmers of Warrick and Spencer counties to ship their produce and obtain the necessary supply of goods. Though it was a profitable venture, and made him among the wealthiest in the county, he always looked at Evansville as the economic hub of Southern Indiana. As a result Phelps was a strong advocate of railroad and other improvements to Evansville, and the growth of the surrounding country. Realizing that land as well as river transport was necessary for Newburgh’s growth, Phelps instigated and was an officer and major stockholder in the Old Plank (or Toll) Road, which operated a one-lane road to Boonville, and which had a tollkeeper with an iron hook for a hand at its Boonville end. Phelps was a noted philanthropist. In addition to starting the Presbyterian Church, in 1843 he helped found an academy in Newburgh, and he later donated $20,000 in an effort to get a college to locate there. In 1860 he donated land for the German Zion United Church of Christ. Phelps died in 1885. His papers are on file with the Indiana Historical Society.